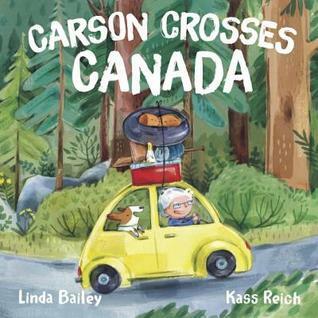 Feisty Annie Magruder and her dog, Carson, live in British Columbia, Canada, and they’re setting out to visit her sister, Elsie, in Newfoundland. In their little rattlebang car, packed with Carson’s favorite toy, Squeaky Chicken, and plenty of baloney sandwiches, Annie and Carson hit the road! They travel province by province, taking in each unique landscape and experiencing something special to that particular part of this vast, grand country. For example, they marvel at the beauty of the big, open sky — and grasshoppers! — in Saskatchewan and discover the gorgeous red earth and delicious lobster rolls in PEI, before finally being greeted by Elsie — and a suprise for Carson!